One of the biggest draws to visiting Ensenada (for me at least) is the seafood. It is home to the best fish tacos in Mexico, it’s home to the (supposed) best street food stall in the world, and you can have all of these things for a ridiculously low price. I tried a lot of different seafood in the week that I was in Baja and this is the best seafood in Ensenada in my humble opinion. 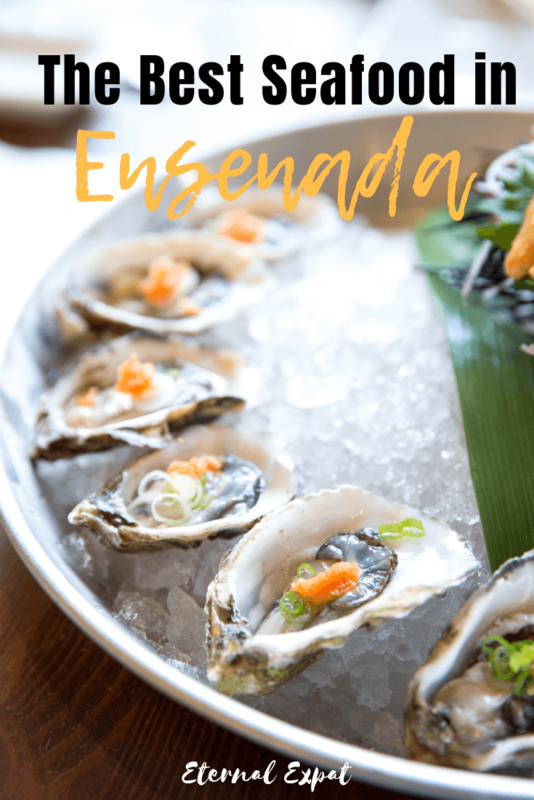 Planning a trip to Ensenada? 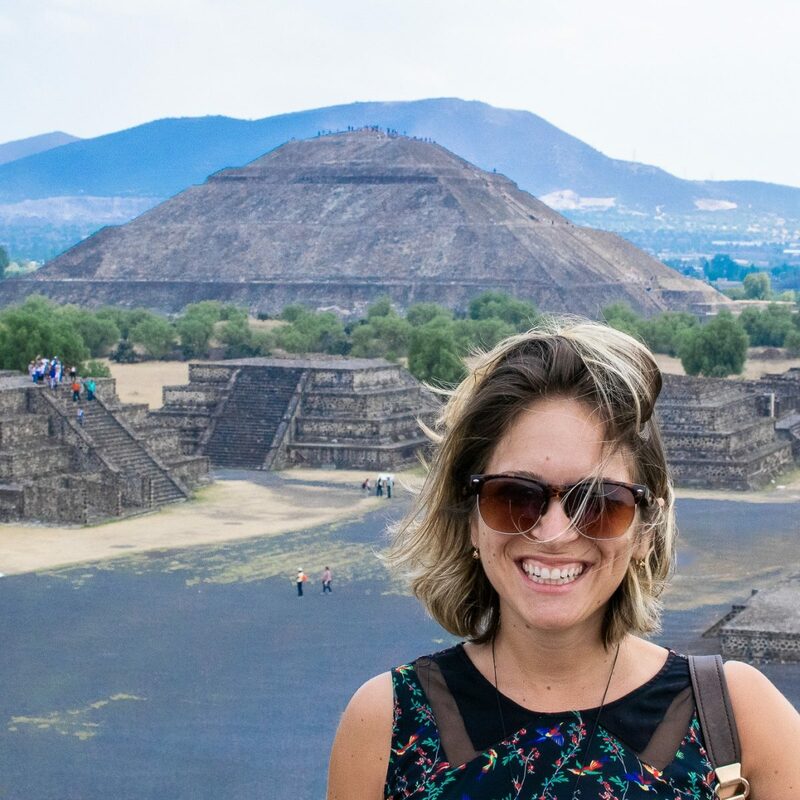 Don’t forget to check out my article about all the best things to do in Ensenada! If you’re looking for the best fish tacos in Ensenada, then this is the place to head. Baja-style fish tacos were basically invented in Ensenada and in my opinion, Tacos Lily is doing it right. I first heard about this place on Anthony Bourdain’s No Reservations when he went to Tijuana and Ensenada. When you visit here you’ll even see pictures of him posing with the chef. It’s a simple stall next to the fish market that does a wide selection of seafood dishes. However, for me, there were only two things I wanted to try: the fish tacos and the shrimp tacos (pescado and camaron). The shrimp tacos were some of the best food I ate on this entire trip. They were so incredibly fresh and they were fried to order, so we had to wait a few minutes for her to prepare the shrimp, batter it, and then fry it to absolute perfection. She rolls each of the tacos up individually in paper to keep them hot while you eat the others. You can then choose between all of the toppings – shredded lettuce, Bandera salsa (onions, tomatoes, chilis), and tons of different sauces. My mouth is watering just thinking about those tacos. 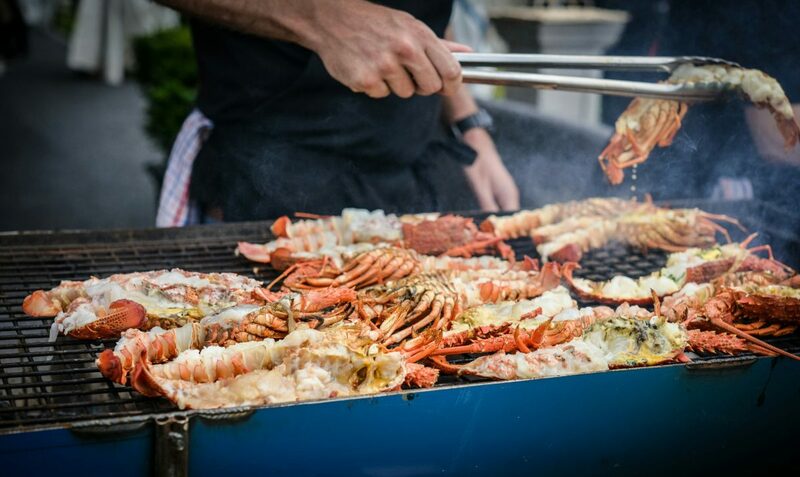 This is just generally a great place to head if you want to 1) purchase some fresh seafood to take back to your place and cook up or 2) find all of the best seafood restaurants in town. The market is surrounded by tons of different little stalls and restaurants serving up the seafood that is purcahsed at the market. My favorite places line the block opposite the market and most of them are open until 8pm or slightly later. Finding a food seafood place for dinner around town can be difficult, so the fact that most of these places are open after dark is great. Most also serve up ice cold beers to enjoy alongside your seafood. Perhaps the most famous place on this list, El Guerrerense has been ranked the number one street stall in the entire world several times over. Anthony Bourdain also stopped here on his episode of No Reservations and called this place Michelin Star quality food on a plastic plate, so we definitely had to check it out. The street stall is only open a few days a week (because there is now a restaurant which I mention below), so be sure to check a few times. I also highly recommend going early – between 12 and 1 p.m. because the good ceviches sell out really quickly. All of the simple, pre-mixed ceviches are only 25 Pesos. If you want one of the more extravagant ceviches topped with fresh clams, they only cost 100 Pesos. My favorite ceviche there was definitely the mixto. It is a combination of octopus, shrimp, fish, and clams. I also really enjoyed the bacalao, which was totally different to any type of seafood tostada that I’ve had before. For those visiting Mexico City, it’s worth noting that they have also recently opened up a location in Condesa. This is the new(ish) restaurant that has been opened by the owner of El Guerrerense. You can now enjoy all of the same ceviches (for a few Pesos more) with a comfortable indoor seat. They also have one of the best octopus tacos I’ve ever had. All they do is cook-off the octopus legs in some oil and spices and serve it in a tortilla with some cooked onions. You can then choose from their huge selection of housemade sauces. They also have a hot-bar where you can get fried fish or shrimp tacos and they serve locally brewed craft beer, too. You may also want to come to this place instead of the stand if you’re low on cash. They take credit and debit card here, which of course they don’t do at the street stall. 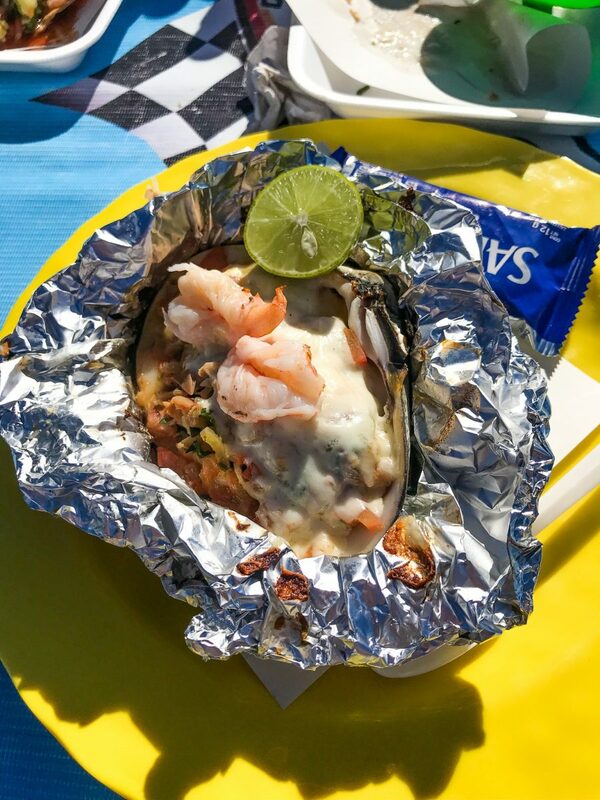 The popularity of El Guerrerense has meant that other seafood street stalls are cropping up all over Ensenada. If you don’t want to wait in line at El Guerrerense, head down the street to El Guero. 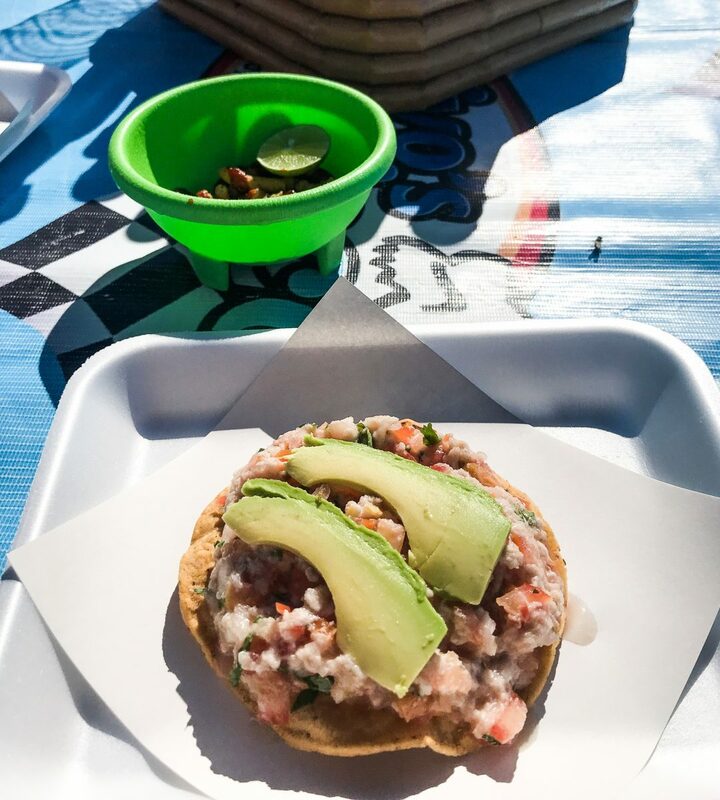 The tostadas are slightly more expensive (each one costs 100 Pesos), however, they are packed full of seafood and the quality of the fish seems slightly better. This is a really great place to come if you enjoy the very popular Mexican style of serving seafood (at least very popular in Ensenada), seafood cocktails. Basically, they chop up the seafood of your choice and then put it into a cup with different sauces and spices. It is as fresh as it gets, especially if you enjoy oysters, clams, or shrimp. This is the delectable smoked clam that I had a Mariscos Yiyo’s and I still dream about how delicious it was. This tiny little vendor in a parking lot at the beach next door to a random Oxxo is serving by far the best seafood in Ensenada. I’m so sad that I only ate here on my last day in Ensenada because otherwise I would have stopped here several more times during my trip. The specialy here is the smoked clam. I highly recommend trying it a few different ways. It’s the perfect starter if there are a few of you sharing. The other thing that I loved here was the shrimp taco. They sliced them in half and cooked them on a super hot barbecue with some onions and spices and then popped it into a super-thin flour tortilla. It was utter perfection. 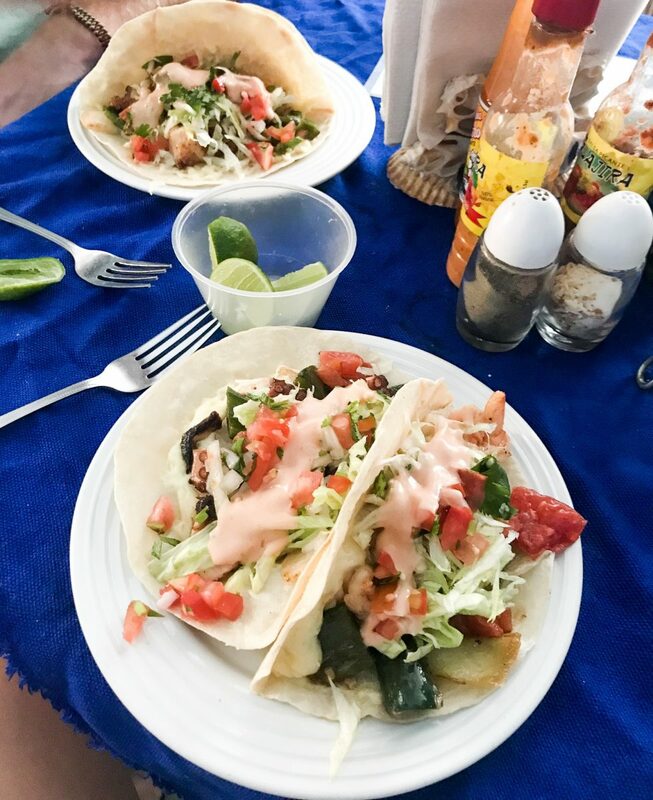 Besides offering some of the freshest and best-cooked seafood in Ensenada, Yiyo’s has the added advantage of facing Playa Hermosa, so you get to listen to the sound of the ocean and look out at the beach while you sit at their plastic tables for lunch. This was the first street stand we tried when we got to Ensenada. 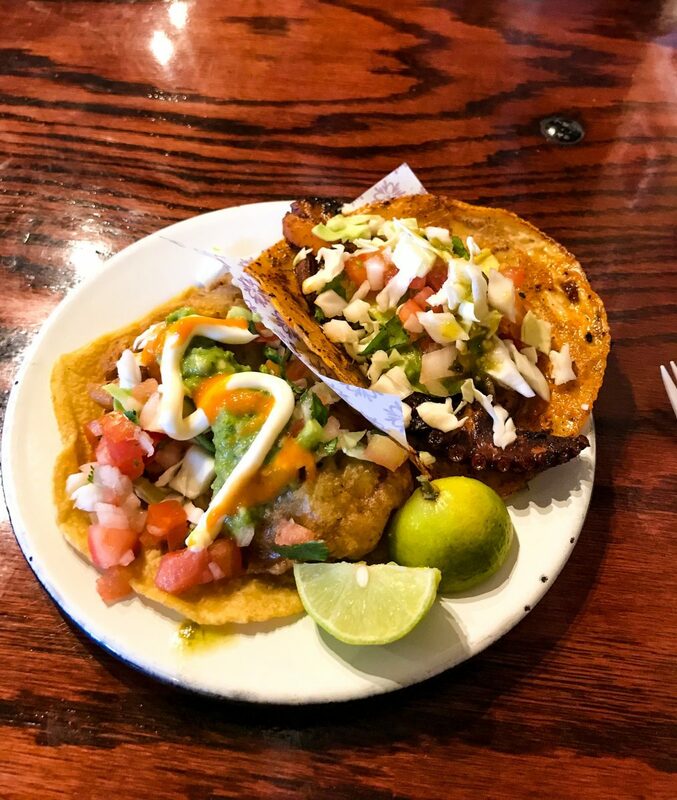 It was simply because it was the very first place we spotted and we were famished after a long day of travel from Mexico City. It was busy with locals and there were no menus, so we just asked for two ceviche tostadas because that’s all that we could see they were serving. The fish was perfectly fresh. It was full of lime flavor, there was tons of fish in it, the balance of salty and sour was delicious. It’s still one of the best fish ceviches I’ve ever had and I highly recommend stopping here for a snack during the day. They also have a huge selection of seafood cocktails. Everyone next to us seemed to be getting huge cups full of freshly opened clams, so if that’s your thing, it looked pretty great here. One of the last places we tried here was Mariscos Bahia de Ensenada. This is a sit-down restaurant with tons of options at a very very reasonable price. A lot of people recommended Manzanilla to us when we were planning our trip to Ensenada, but we just kept avoiding it because we loved all of the simpler, and quite frankly, cheaper options available around town. On one of our last nigh,ts it was between Mariscos Bahia and Manzanilla. In the end, we opted for Mariscos Bahia simply because it seemed a little less stuffy. It almost looks like a diner from outside. The seafood was exactly what we were hoping for. My boyfriend and I shared a whole fish which is available in several different styles (grilled, fried, cooked in garlic, and Veracruz style). We also tried their aguachile which is basically a ceviche made with shrimp. It was absolutely delicious.